Arkon offers the widest assortment of car mounts compatible with the BlackBerry Pearl 8100 and the Sanyo Sprint M1. The cradle / holder was custom designed specifically for the BlackBerry Pearl 8100 and Sanyo Sprint M1 phones. The back of the cradle features Arkon's Dual T Slot mounting pattern thereby making this entire family of products compatible with any of Arkon's Dual T Tab pedestals. Solutions shown below are complete bundles. each fits inside the custom cradle perfectly. Ideal for use with portable GPS devices that use Arkon's Dual T slot pattern like All Magellan RoadMate etc Central to the design of Arkon's new GN032-SBH handlebar mount is the compatibility with bicycle and motorcycle sized handlebars. Ideal for use with portable GPS and Phone devices that use Arkon's Dual T slot pattern Arkon's BBP120 Mount is a complete car mounting bundle for your BlackBerry Pearl 8100 phone. The Mega Grip holder is designed to securely hold larger “Super Phones” such as the Samsung Galaxy S, Motorola Droid 2, Motorola Droid X, HTC EVO 4G, HTC Droid Incredible, Apple iPhone, and more. 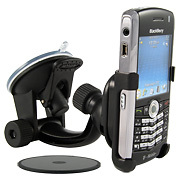 Arkon's BBP115 Mount is a complete car mounting bundle for your BlackBerry Pearl 8100 phone. When used properly, you can insert and remove this mount easily from your car's air vent louvres without causing any damage. Arkon's AP016 allows you to convert the 4 Hole AMPS pattern found on the Magellan RoadMate 700 and 800 series to Arkon's Dual T Connector pattern. Compatible with Arkon's CM014, GN014, GN115, TTO115, TTOXL115, TT115, PTM115, and BBP115 series. The cradle / holder was custom designed specifically for several models of the BlackBerry Pearl.